Some people are scared of lions, tigers, and bears (oh my). Not me. For me its lions, tigers… what the… FLYING SNAKES!?!? Yes, “flying” snakes. They may not be as big as lions, tigers or bears, but at 2 to 4 feet the carnivorous buggers definitely catch a wondering soul in the forested regions of Sri Lanka off guard as they soar from tree to tree snatching small birds, lizards, and rodents up for a snack. The five known species are located mostly in one region of the world, Southeast Asia, southern China, India, and Sri Lanka. The snakes shimmy/slither their way up a tree, get to the end of a branch and hang by their tail. Once hanging they form a “J” shape with their body. Now, in position they proceed to find an ideal target or landing area then launch themselves up and away from the tree. 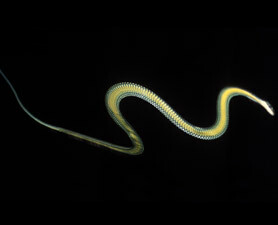 Once in the air the snake “flattens out” to twice its normal width and makes a slight concave C shape to help trap air, similar to the shape that a paragliding parachute makes. It is very effective for trapping the air and allows for the changing of direction during flight. They position themselves at about a twenty-five degree angle, heads up and tails down, to maximize their air time and distance. It is also said that the S shape may reduce the air pressure on the top of the wing ultimately reducing the net downward force. Another question that comes to mind is: Just how far do they fly? 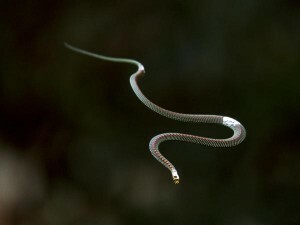 They travel different distances from species to species but “The paradise tree snake [one of] the smaller flying snakes and the best glider, [has] been known to travel up to 330 ft (100 m) in the air.” (National Geographic). Finally, now that I’ve covered what a flying snake is, I can tell you why I place the quotation marks around “flying.” It is because the snake (and squirrel) do not actually fly. Rather, they glide, at best, formerly thought of as parachuting. The research on these majestic snakes has not been going on for that long. There is constantly more and more being done to learn about them. As for now, there is not much more I can give you. Good job, Daniel. You’ll get the chance to ask questions directly to Prof. Socha when he joins via Skype as our next guest speaker in this course! Come prepared with questions next Monday.